The Yamaguchis and the Montanos are two immigrant families struggling to provide a future for their American-born children after the Great Depression on the farmland they share. But as their oldest children fall in love-secretly-the attack on Pearl Harbor throws these Mexican and Japanese American families into uncertainty and turmoil. When the Yamaguchis are interned along with thousands of other Japanese Americans, allegiances are tested, heroes are made, and the two young lovers must find a way to stay loyal to each other-and their country. "...The play resembles at times a graphic novel brought to the stage. The characters and the dialogue have all the realism of a historical cartoon. But what is lost in subtlety of detail is partly gained in breadth of perspective." 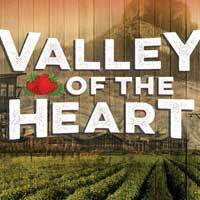 "...His latest play, the phenomenal VALLEY OF THE HEART at the Mark Taper Forum through December 9, 2018, uses California history as a jumping-off point to tell an important story about the fight to maintain dignity, identity, family and faith in the once-fertile farmland that is now known as the Silicon Valley." "...Captivating stagecraft and a winning, although not always authentic, cast fuel this epic tale of war-time love. But the riveting aspects of a relationship between two American citizens � one Mexican, one Japanese � are diluted when didacticism dictates drama. Writer/director Luis Valdez has his heart in the right place, but he spends too much time putting it on his sleeve in his memory play, Valley of the Heart, now on at the Mark Taper Forum." "...Epic in scope, educational in intent, and exquisite in design, Luis Valdez's Valley Of The Heart examines America's WWII internment of its Japanese-American citizens and their foreign-born family members in ways both familiar (the Broadway musical Allegiance played L.A. just ten months ago) and original (our narrator is Mexican-American). If only the Zoot Suit playwright proved more adept at creating authentic-sounding dialog. If only Valley Of The Heart didn't so often feel like Wikipedia on stage." "...Valley of the Heart filled my heart with joy, sadness, and the affecting energy of the Teatro Style. Its all one could ask for. I left the theatre with a buoyant heart and great appreciation. See this show!" "...Ultimately, many of the twists and turns feel predictable. While the subject matter is certainly relevant, moving, and timely today, this specific story is full of melodrama. This feeling largely comes across due to many of the performances, which are very soap-operatic and over-the-top. Lakin Valdez's Benji feels the most grounded of the characters, but he is often a bit unlikable, frequently getting irrationally jealous of Calvin, whom Thelma has never had a romantic feeling towards." "...I told you Valdez is not a subtle writer, and he gives his audience what they (we) want to hear when, late in the play, one of his central characters states: "California is now half Latino and Asian, and there's not a damn thing anybody can do about it." When the lights went down and came up again, the audience, made up of some of the old-time subscribers, but also, amazingly, of a audience of Japanese men and women and Chicano couples, some even dressed in their native attire, hollered out with screams and hoots for their complete appreciation of Valdez's work. His is truly a theater of the people, something perhaps we need in these terribly divisive times. Valdez's play is about bringing communities together, and it works. Let us now praise famous men."